Tablet users raising now-a-days which leads to make more Andriod Tablets by most of the manufatures. Yes, Relaiance Communications lanched 3G Android Tablet with Gingerbread and its own bundled 3G service, and with data plans yesterday in India at Rs.12,999 ($288). Which is manufactured by a Chinese manufacturer ZTE but, with a Relaiance brand name. It has a 7-inch touch screen and loaded with 512MB RAM, standard 2MP rear camera and a VGA front camera for video conferencing and supports external storage micro card upto 32GB. And has few more features of Mobile TV, GPS, Wi-Fi, voice calling and Video recording. It provides corporate customers with “Documents to Go” service which has push mail, and microsoft word, excel,powerpoint and PDF attachements along with supporting teanegers which includes live video streaming, social networking and entertainments too. “Reliance Communications has always been a pioneer in taking bold steps to innovate and re-invent the telecom ecosystem in the country, and has always believed in bringing products to Indian customers that fulfill their needs and desires with incredible affordability. The launch of Reliance 3G Tab is in line with this principle. We believe the unmet demand of a fully loaded tablet at an aggressive price point will now fuel the aspirations of the evolved customers”. 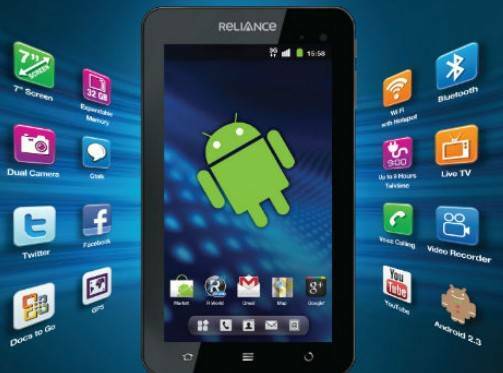 Relaince 3G Gingerbread tablet is available now in Mumbai, Delhi and Kolkatta. And, it will be available soon in few more days at Relaiance World and Relaiance Mobile Stores across the 13 3G cicles.